The New York Giants have found the new leader of their front office. On Thursday, the Giants announced that they have hired Dave Gettleman as their new GM. Gettleman is a familiar face for the Giants organization. He joined the team as a scout in 1998 and worked as pro personnel director from 1999 to 2011. After serving as senior pro personnel analyst in 2012, Gettleman left to become the GM of the Carolina Panthers. Now he’s on his way back to New York to fix the colossal mess that is the 2017 New York Giants. This season has been an unequivocal disaster for the Giants. They enter Week 17 just 2-13 after many picked them before the season to win the NFC East. Both GM Jerry Reese and head coach Ben McAdoo were fired earlier this month. 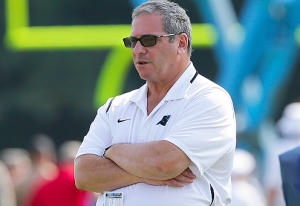 The team has since moved quickly to find new leadership, starting with the hiring of Gettleman. Prior to hiring Gettleman, the Giants also interviewed interim GM Kevin Abrams, vice president of player evaluation Marc Ross, and ESPN analyst Louis Riddick. Former Giants GM Ernie Accorsi served as a consultant for Mara and Tisch during the interview process. Of course, Accorsi was the GM of the Giants when Gettleman was first hired by the Giants in 1998. During Gettleman’s four seasons as Panthers GM, the team posted a record of 40-23-1. Despite coming to Carolina with the team in a tough financial situation, the Panthers won three straight NFC South division titles. More notably, the Panthers reached the Super Bowl following a 15-1 regular season in 2015. In a shocking move, the Panthers fired Gettleman in July right before the start of training camp. It’s believed that he was fired because of the hard stance he took in contract negotiations with players who ownership felt deserved to be treated better because of their contributions to the organization. Several current and former Panthers actually expressed joy when learning that Gettleman had been fired. Of course, the Giants know what they’re getting into with Gettleman. Team ownership is familiar with him and will know what he brings to the table both good and bad. However, whether Gettleman can get the Giants turned around after a disastrous season remains to be seen. There are a lot of issues facing the Giants and many questions that must be answered. Fixing the Giants may be the toughest challenge Gettleman will ever face in his career. Fortunately, the powers that be with the Giants will no doubt feel like they are in good hands.